In a DPRK Special Report entitled "North Korea's Uranium Exports: Much Ado About Something," Nautilus Executive Director Peter Hayes, asserts that the primary significance of the recently reported export of North Korean uranium to Libya is not the export itself, as that material is available from many suppliers around the world, but rather, the fact that North Korea may have already developed uranium hexafluoride capacity, an important prerequisite for enriching its own uranium. The report was picked up by various media outlets including the Korea Herald. On May 20, 2004 Peter Hayes spoke via videoteleconference on 'US Security Policy: The Parameters of Debate' to the multi-national participants in the Centre for Defence and Strategic Studies course on The Contemporary Strategic Setting at the Australian Defence College, Canberra. Hayes outlined long-term historical US foreign policy orientations, 20th Century Cold War policy currents, and contemporary US foreign policy trends and answered questions from participants. With gusts of wind up to 30 knots, Berkeley Boosters sailors from Rosa Parks Elementary completed their final Pegasus voyage on Thursday, May 26. The spring season emphasized teamwork, basic sailing principles, and environmental awareness -- a unique experience for the fifth graders, most of whom had never been sailing on the bay before. The voyage was crewed by Pegasus volunteers Mark Caplin, Jim Gaebe, Christine Alberstsen, Nancy Navarro, John Verello, and Peter Berteslsen. The Nautilus Institute's 2004 Asian Energy Security (AES) Workshop recently concluded in Beijing. The workshop which lasted from May 12th to 14th, 2004 was co-hosted by the Energy and Environmental Technology Center (EETC) of Tsinghua University. The main focus of the workshop was collaborative research, involving the DPRK, the ROK, the Russian Far East, China, Japan, and Mongolia on different paths to addressing energy security issues in the region. The emphasis was on both national and regional approaches to energy security concerns. We have posted a participant list, agenda, paper list, and photos at Asian Energy Security Network. The New-Land Foundation awarded a $25,000 grant to support Nautilus' "Avoiding Nuclear Proliferation and Nuclear War in Korea Project" which seeks to move the US and North Korea toward peaceful dialogue. The funding will be used primarily to support the continued publishing of the US-DPRK Briefing Book-- a centralized, multi-perspective, virtual-briefing book for policy makers, mass media, and the public at large. On Friday, May 21st, students from Malcolm X Middle School along with the Berkeley Boosters club completed an extended long day sail aboard the Pegasus. Sailing across choppy waters of the Bay to Angel Island, the sail emphasized environmental awareness and the importance of teamwork and lifeskills. The Nautilus Institute's 2004 Asian Energy Security (AES) Workshop is currently in session in Beijing from May 12th to 14th, 2004. This event is being co-hosted by the Energy and Environmental Technology Center (EETC) of Tsinghua University. The main focus of the workshop is collaborative research, involving the DPRK, the ROK, the Russian Far East, China, Japan, and Mongolia on different paths to addressing energy security issues in the region. The emphasis will be on both national and regional approaches to energy security concerns. More information on Northeast Asian energy can be found on the Asian Energy Security Network. Caprio Asks "Will North Korea Follow Libya's Example?" The NAPSnet Policy Forum posted an essay by Mark Caprio, a specialist on Japan-Korea Relations and professor at Rikkyo University, entitled, "Will North Korea follow Libya's Example and Renounce its Nuclear Weapons Programs?" Caprio proposes that the United States must take the initiative to create the conciliatory atmosphere needed to nurture peaceful change rather than anticipate North Korea following the voluntary path of Libya. The Myrtle L. Atkinson Foundation awarded Nautilus Institute's the Pegasus Project $5000 for general program support. Funds provided will be applied toward Project Lifeskills. Project Lifeskills strives to help build a strong foundation of life skills for at-risk and disadvantaged youth through series of day sails and overnight voyages aboard a 51' ketch. Partner organizations participating in Project Lifeskills include the Berkeley Boosters and Alisa Ann Ruch Burn Foundation. The Nautilus Institute unveiled the new website for its 2004 Asian Energy Security (AES) Workshop to be held in Beijing from May 12th to 14th, 2004. This event is being co-hosted by the Energy and Environmental Technology Center (EETC) of Tsinghua University. The main focus of the workshop is collaborative research, involving the DPRK, the ROK, the Russian Far East, China, Japan, and Mongolia on different paths to addressing energy security issues in the region. The emphasis will be on both national and regional approaches to energy security concerns. More information on Northeast Asian energy can be found on the Asian Energy Security Network. In an article for the Associated Press entitled "Two Faces of N. Korea Emerge After Blast," Christopher Torchia cites and credits Peter Hayes' essay "Kim Jong Il Should Read George Bush's Lips" with recognizing the underlying significance of the US' offer of aid to North Korea. Torchia writes, "Peter Hayes, a North Korea expert, cited the symbolic potential of the U.S. offer to send medical specialists to assist the North Korean rescue effort, which would come on top of a $100,000 contribution for humanitarian aid. Hayes, executive director of the Nautilus Institute, a Berkeley, Calif.-based research group, urged North Korea to accept the offer." The story was covered by the Los Angeles Times, Washington Post, UK Guardian, and a number of other national and international newspapers. The original essay was part of the Nautilus Institute's Policy Forum Online. In 1968, tensions were much higher in the Korean Peninsula than today. The United States had a variety of tactical and theater nuclear weapons deployed in South Korea and surrounding oceanic and airspace, and on other forward bases in the region including Okinawa and Guam. As part of the Global Disclosure project, a report by the US Army Headquarters Seventh Infantry Division Artillery entitled "Operational Report for Quarterly Period Ending 30 April 1968" was made available and reveals that the US Army was exploring whether it could reliably and efficiently lower the operational assignment of nuclear weapons from the Brigade to Division level in order to "facilitate the timely utilization of this type of fire [nuclear weapons] to respond to a North Korean attack or threat." This report released to the Nautilus Institute Under the US Freedom of Information Act (FOIA). Students from 1000 Oaks Elementary School in Berkeley voyaged onto the East Bay in the last voyage of the Shorebird Nature Center series with the Pegasus Project. This class had already journeyed to the Sierra Mountains to see where the origin of rivers flowing into the Bay-Delta. At Strawberry Creek which runs through 1000 Oaks School they measured the water quality and found it polluted by sewage. So they called in the Mayor and found the sewer leak which was repaired by the City. On Pegasus, they saw where the waters from the high Sierras meet the great tidal Pacific Ocean, completing their watershed curriculum. Hailing from Tonga, Thailand, Taiwan, being African-American, Hispanic, and Caucasian origin, they all spoke the common language of the ancient sea and old salts aboard Pegasus. They heard the birds, the waves and wind, and imagined what the Bay looked like before the Spanish arrived. Back at the dock, Donntay and Cello said that being on the bowsprit was "like a cheesy action movie" (Titanic). Those who got to steer loved driving the Pegasus. Another student learned that the lead keel stops the boat from tipping over when it is heeled by the wind blowing in the sails. Said Sampson: "Sailing on Pegasus was tight." The voyage was helmed by Paul Marbury. Chris Erikson was on foredeck, Jim Gaebe at port winch and Patty Donald on starboard winch. Peter Hayes was at lookout. Pyongyang Missing US Breakthrough Cooperation Offer? In a NAPSNet policy forum essay entitled "Kim Jong II Should Read George Bush's Lips," Peter Hayes argues that "North Korean leaders may miss a critical opportunity to test the genuine intentions of the Bush Administration with regard to the future of the DPRK. The White House's offer to send expert medical assistance to Ryongchon before the resumption of lower-level working talks on the nuclear issue on humanitarian grounds should not be interpreted narrowly." This is the first time that the Bush Administration has offered cooperative engagement with the DPRK before the resolution of the nuclear issue. This window of opportunity will not remain open long, so the "North Korean leaders must sift out the genuine from the politically motivated positions of the Bush Administration." On April 27th and 28th, Nautilus Institute convened a scenarios workshop to answer the focal question "Who Will Stop Nuclear Next Use?" International participants from a variety of institutions and disciplines gathered to brainstorm, examine, and deconstruct scenarios aimed at the prevention of nuclear next use. A Nautilus Briefing Paper, entited "Global Insecurity and Nuclear Next-Use," explores the uncertainties and opportunities for reducing the risk of nuclear war. On the workshop website, you will find details about the workshop, including background briefings, reports from previous scenarios workshops, and at the end of the month, the final workshop report. On April 28 and 29, the Nautilus Institute's vessel, Pegasus, set sail six times with students from the Berkeley Boosters and Shorebird Nature Center. Preparation for the voyages included a land school at Cal Sailing Club for the Nature Center group and a dockside training in conjunction with Berkeley Yacht Club for the Booster's Students. Land school and dockside trainings emphasize boat terminology, safety and navigation. The on the water experience adds an experiential element that emphasizes environmental awareness. Almost 80 students total participated in the San Francisco Bay voyages, all of which were crewed by Pegasus Project volunteers. On April 27th and 28th, Nautilus Institute will convene a scenarios workshop focusing on "Who Will Stop Nuclear Next Use?" Representing government, civil society, media, artists, military, and universities, participants from the US, Canada, Australia, India, Nepal, Pakistan, and South Korea will explore the uncertainties underlying and opportunities for reducing the risk of nuclear war. On the workshop website, you will find details about the workshop, including background briefings, reports from previous scenarios workshops, travel information, and after May 15, the final workshop report. The Nautilus Institute unveiled the new website for its 2004 Asian Energy Security (AES) Workshop to be held in Beijing from May 12th to 14th, 2004. This event is co-hosted by the Energy and Environmental Technology Center (EETC) of Tsinghua University. The main focus of the workshop is collaborative research, involving the DPRK, the ROK, the Russian Far East, China, Japan, and Mongolia on different paths to addressing energy security issues in the region. The emphasis will be on both national and regional approaches to energy security concerns. More information on Northeast Asian energy can be found on the Asian Energy Security Network. WBEZ Chicago's Worldview Program interviewed Peter Hayes on April 19, 2004 on the political and security situation in and around the Korean Peninsula. Peter explained that the South Korean vote to put President Roh in power has parallels to the 1958 surge in anti-US alliance attitudes in Japan that led to the eviction of US nuclear weapons in 1960. Hayes suggested that the Bush Administration's policies are leading to diminished American influence on security outcomes in both Koreas, and to regional powers cutting their own deals with a nuclear-capable North Korea. Master rigger Brion Toss gave a rigging workshop on vessel Pegasus for crew on April 18th followed by a short voyage with Brion aboard. Brion explained that the specific details of any component of the rigging are determined by the overall loading and optimal design for loading the vessel. He suggested that we should "be the boat" and figure out the big picture before tuning any specific item. The DPRK Briefing Book posted new papers in its Agriculture and Humanitarian policy area this week. The 2003 report "Crop and Food Supply Assessment Mission to the DPRK" by the UN Food and Agriculture Organization & UN World Food Programme and the situation report "Misery and Terror: Systematic Violations of Economic, Social, and Cultural Rights in North Korea" by the UN Committee on Economic, Social, and Cultural Rights of the DPRK are now available. Nautilus released this study in preparation for Nautilus Institute's fifth East Asia Energy Futures/Asian Energy Security Program workshop to be held in Beijing, China May 12-15, 2004, Nautilus will release energy demand and transformation data collected from six countries to include: Japan, China, Russian Far East, Mongolia, ROK, and the DPRK. Country datasets are created using Long Range Energy Alternatives Planning (LEAP) software and data is exported to user-friendly excel files for the purpose of dissemination. Last year's workshop's website is: here. The Pegasus encountered choppy seas over the Berkeley flats due to a strong ebb tide colliding with strong northwesterly winds. Heading out toward Angel Island, crew reefed the mizzen and the furling jib. At the debriefing, Ruch voyagers said that riding on the bowpsrit "was a blast" even when soaked by spray and green water over the anchor well from the confused seas. Nicole confessed, "I didn't like being cold; I liked throwing up because it made me feel better." Dustin expressed, "I liked driving. I didn't like the cold. I learned to wear more clothes." While Brandon explained, "What I liked the most was the very tip of the bowsprit. I learned to look at the horizon because it doesn't move." The Nautilus Institute Global Disclosure piece "Vulnerability of North Korean Forces, Vol. I: Evaluation of Vulnerability of North Korean Divisions to Tactical Nuclear Weapons," released under the US Freedom of Information Act (FOIA) was cited in the Washington Times, Chosun Ilbo, and Stars and Stripes. Chosun Ilbo noted "... the study suggested that at least 30 airburst nuclear weapons would be used in an area only nine miles from Seoul and some 15 miles south of the DMZ. The Nautilus Institute indicated that around the time the DNA was looking into the use of tactical nuclear weapons, the Carter administration was struggling with its withdrawal policy for U.S. forces in Korea." 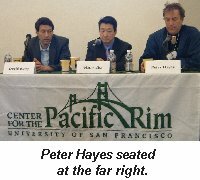 At the University of San Francisco's Center for the Pacific Rim workshop "North Korea's Nuclear Crisis" on April 2, 2004, Peter Hayes chaired the opening session on "The State of the Crisis and Engagement Strategies." The Nautilus DPRK Policy Forum published two essays on the DPRK. The first was "North Korea: Guns or Butter?" by Leed's University's Aidan Foster-Carter which analyzes recently reported economic data to argue that Kim Jong-il "military-first" policy is a direct barrier to economic recovery. The second piece was a Memorandum on "Areas In Which US/DPRK Joint Recovery Operations Have Been Conducted" since 1996. It was written and compiled by Ashton Ormes, Research Director of Defense Prisoner of War and Missing Personnel Office. The DPRK Briefing Book posted several documents and analyses in its European Union policy area. Analytic essays and reference documents relevant to diplomacy, development, KEDO, and humanitarian aid between North Korea and the European Union are now available. These include : "EU�s Policy Towards the DPRK: Engagement or Standstill?" by Dr. Axel Berkofsky Axel Berkofsky, "EU Multilateralism on Korean Peninsula" by Sebastian Harnisch, and the EU-DPRK Country Strategy Paper 2001-2004 to name a few. In 1976-78 while the Carter administration was struggling with its withdrawal policy for US forces in Korea, the Defense Nuclear Agency was examining how to use tactical nuclear weapons to coerce North Korea on the battlefield and is documented in their two volume study on the "Vulnerability of North Korean Forces." The study was obtained via the Freedom of Information Act and was released as a part of the Global Disclosure Project. On Sunday, March 27, Pegasus volunteer crew including Captain Paul Marbury, Mark Caplin, Christine Albertsen, Kris Wolf, Andrew Harkness, and Jim Pascucci sailed in shifting winds and plenty of sunshine. As the vessel headed through Raccoon Straights towards the Golden Gate, Pegasus received an emergency call from a Pegasus Volunteer on his own vessel sailing in the vicinity and reporting an inboard electrical fire. Pegasus crew responded quickly and professionally and were able to assist the endangered vessel, keeping it out of harms way until a towing vessel arrived.